supriya chakraborty was used to tomato farmers in Varanasi complaining about their dwarfed plants that would produce no fruits. The agriculture scientist saw many farmers shift to other crops. First the leaves would turn yellow, curl up and then the plants would stop growing--the unmistakable symptoms of the tomato leaf curl disease. Chakraborty was responsible for growing tomato varieties resistant to the viral disease at the Indian Institute of Vegetable Research in Varanasi. When he began collecting samples of tomato plants, he noticed they showed symptoms of being infected by three strains of the virus of genus Begomovirus. Some plants showed severe curling, some mild.Infection by multiple strains was unusually frequent; it was an ingenious virus that changed its dna component quickly and adapted to new cropping systems. Curious, Chakraborty began studying the biology of the virus, and how it recombined with other viruses. He collected samples of tomato plants from across the country, isolated Begomovirus dna s and compared them. Five years into his research, Chakraborty, now at the Jawaharlal Nehru University in Delhi, has discovered a new species of the tomato leaf curl virus. In December 2007, a severe leaf curl disease of tomato occurred in Patna, Bihar. The virus from Patna showed very little similarity with the known species of Begomovirus. Chakraborty named this species tomato leaf curl Patna virus. He has described the virus in May 2009 issue of Plant Disease. This is the ninth species of the tomato leaf curl virus found in India since it first surfaced in the country in 1948. "These viruses are known to be highly variable. They can change easily, which makes their management difficult," said Rakesh Jain, head of plant pathology at the Indian Agricultural Research Institute in Delhi. Tomato occupies a significant position in vegetable production. The total area under tomato cultivation in India is about half a million hectare or 7.3 per cent of the total cropped land under vegetables. India produces 8.6 million tonnes of tomato a year, which is 8.5 per cent of the total vegetable production. Orissa, Andhra Pradesh, Karnataka, Maharashtra, Bihar, West Bengal and Gujarat contribute more than 65 per cent of this. Spread by white flies (Bemisia tabaci), the leaf curl viruses are prevalent in these states and can damage 40 to 100 per cent of the crop. Chakraborty says understanding the biology of the virus is important for blocking it. 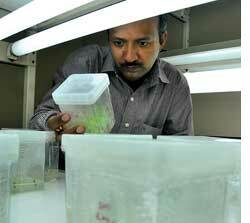 According to Jain, the best way to contain the disease is developing host resistance. Conventional methods of developing a resistant variety of tomato take at least 10 years, by which time the virus mutates to a new form, so Jain prescribes transgenics that can be developed quicker by inserting foreign genes that can resist the virus. Although leaf curl viruses, along with tomato species, have been evolving for over a millennium, they have caught the attention of scientists in the past 50 years. The main reasons for their spread are agricultural intensification and an increase in populations of the white fly. The white fly can infect all members of the solanaceae family, to which tomato, potato, capsicum and brinjal belong. It also infects members of the cucurbitaceae family that includes cucumber, pumpkin, melon and watermelon. If the white fly does not find any of these plants, it infects the surrounding plants, including weeds, where the virus exists as a latent infection. When any of the host plants are grown there, they catch the disease. That's how the virus is able to adapt to different cropping patterns. All strains of Begomovirus are good at suppressing plants' defence mechanisms. This allows them to infect many plants. But it is the genome--the complete set of dna--of the Begomovirus that gives it a greater advantage over pest control methods. The virus has high genetic diversity, in large part due to recombination between its genetic components and acquiring of dna strands from other viruses. And it recombines fast. A white fly can pick up mild as well as virulent strains. In four-five years the genetic components of mild strains can recombine and give rise to a virulent species. Leaf curl viruses have also taken genes from other viruses to form a new virus. For instance, combining with the papaya leaf curl virus led to a virus that caused the cotton leaf curl disease in Pakistan. The disease caused a loss of US $5 billion between 1992 and 1997.